Without doubt the highlight evening of any Rotary year is the Changeover Dinner that marks the end of a Rotary year and the terms of office of its Directors and Leadership team. It is an opportunity to reflect on and celebrate the success of the previous year through the experienced eyes of the outgoing leadership and acknowledge all who contributed to outstanding achievements in fundraising, support of community and international organisations, whilst maintaining a high level of goodwill and fellowship. It is also an opportunity for rejuvenation and excitement as the Club looks forward through the eyes of a new Leadership team at the plans and aims going forward. 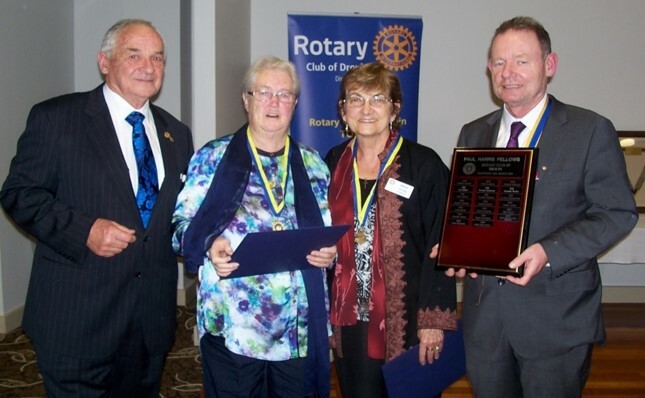 This year was no different when the changeover occurred at the Drouin Golf Club amidst a large gathering of Rotarians, their guests and the leadership of many other local community organisations. In welcoming them all, President Miceal Ambrose acknowledged the presence of District Governor Charlie Speirs and Councillor Debbie Brown Mayor of Baw Baw. Whilst every Rotarian is acknowledged and congratulated on their work for the community, the evening is also a time when outstanding contributions are recognised. The highest award that Rotary can convey on members and/or community volunteers is the Paul Harris Fellowship. This year two Paul Harris Fellowships were awarded to community members June Burrows and Gwen Mulconry. Secretary Tim Wills read out an impressive list of activities and organisations these two ladies had been involved in over many years. The variety and scope of their activities was outstanding as it goes to the heart of a community, involving the young and the old, sport, health, education, values for healthy living and support of the needy. In responding both women expressed surprise, delight and gratitude for the award. Both acknowledged that whilst they may have taken a leadership profile, they had also been backed up by many other hard working people and the important support they received from their families. Another award on the night was a Sapphire recognition to Past President Rex Greenwood, for his long and outstanding service, leadership and management to Lyrebird Village. This occurred through some extraordinarily difficult times. However Rex’s outstanding skill and leadership has resulted in Lyrebird’s current strong position and its filling of an ever growing need for the services of such a facility. Certificates of achievement in Rotary were also awarded to Ray Howe, Don Kelly and Ian Brooks for 15 years and 20 years membership respectively. Clarrie Debnam was awarded a certificate for100% attendance through the 2014/15 year. President Miceal commented that the most pleasing part of his job was the presentation of donations to the various charities and organisations and the Annual Report contains an extensive list of distributions made throughout the year. He was also able to present Assistant District Governor Kaye with a cheque for $7000 on behalf of Centenary House and Janice Ablett with a cheque for $2,500 to go towards the outstanding volunteer work undertaken by the Ice Meltdown volunteers. Further donations were made through the very successful coffee sales at the monthly market where the ladies, led by Jo Copping, were able to distribute $1000 to Warragul Palliative Care, $3,500 to Bryn’s School and $1000 to the Mercy Ship Australia Project. In his closing speech as President, Miceal paid thanks to each one of his Directors individually for their work and support over the year. He acknowledged the extraordinary work of Secretary Tim and all Rotarians. Miceal expressed his great appreciation to be able to serve as President and was grateful that he was able to be associated with Rotary in general and the Drouin Club in particular. The past year was epitomised by the motto “Service Above Self”, he concluded. Miceal was then vested with the symbols of Past President and along with the District Governor the induction of Ian Bennett as the new President took place. He highlighted that each one of us can be a gift to our communities, not just financially but also with our presence and profiles as community spirited volunteers, as well as role models of leadership and of giving. He expressed his feelings of honour and gratitude for being given the opportunity of leading the Club along with the new Board, which he then inducted with their positions and portfolios. Ian’s vision for the year was to continue and build on the work of the past, but he also saw the Club as being a platform for enhancing the profile of Rotary in community education on the where, what, when and how of Rotary and that the Club could also contribute to raising the profile and working collaboratively with other organisations to do the same because in the end, we are all seeking the same goal of a better, fairer and safer community. Ian also believes strongly in the value of fellowship in rewarding Rotarians and in promoting cohesion and satisfaction with in the Club. Important aspects of this were social functions and partner nights. Rotarians enjoying Rotary was to be a big aim of his year as President. The evening closed with the singing of the National Anthem.